Matteo Paro back at Pegli-trainingfield !! Exactly 1 year and 4 days after his injury started in the match Genoa-Napoli, Matteo Paro today returned at the Gianluca Signorini trainingfield in Pegli. After the 2 operations Matteo trained several months in Chiavari, but now the last part of his comeback has to be realized at Genoa’s trainingfield. Maybe Matteo can play some matches at the end of the season, which seemed completely over for him. Welcome back Matteo ! 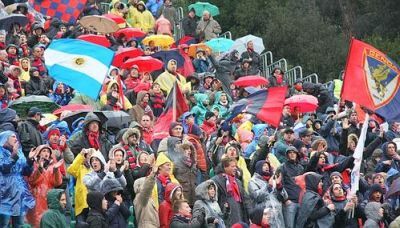 In the meanwhile Genoa already sold over 5.000 tickets to the match Saturday at 18.00 hours against Inter. Probably the match will be totally sold out, because everybody wants to see if Genoa after Milan and Roma also can beat Inter in Luigi Ferraris. Yes we can ! The match ended just as it started: 0-0. In the first half Siena surely was the best team in the field, but our goalkeeper Rubinho was unbeatable. 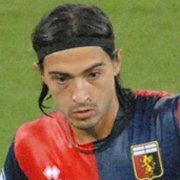 In these first 45 minutes Genoa had less chances than the hometeam, but our topscorer Diego Milito scored a regular goal in the 26th minute that was annulated because of off-side. Just before halftime Maccarone missed a big chance close to Rubinho. In the 2nd half Genoa was the best team and we also got the biggest chance when substitute Palladino hit the post in the 85th minute. Because of the draw we now have 45 points, 3 less then last year at the end of the season. After a victory next Saturday at 18.00 hours in Luigi Ferraris against Inter we have 11 matches left to beat our record of last year heavily and reach European football for the first time since it ended in Amsterdam in April 1992. Last year Genoa booked a 0-1 victory in Siena by a goal of Konko and earlier this season the homematch in Luigi Ferraris also was won by Genoa with 1-0, this time Giuseppe Biava scored the only goal with a header. With Siena play 4 ex-Genoani: defender Portanova, midfielders Coppola + Codrea and striker Ghezzal.